Everyone always wants to know what crafts are the best sellers and which will bring in the most money. The answer is that there isn’t a certain craft. Instead it is all about a few key factors, which I will be getting to. 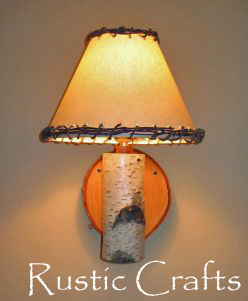 Let me start with the experience that my husband and I had with selling primarily birch lamps. Initially, if we had been looking for what that hot craft item was that was selling like hot cakes, we definitely would not have found birch lamps on the list. 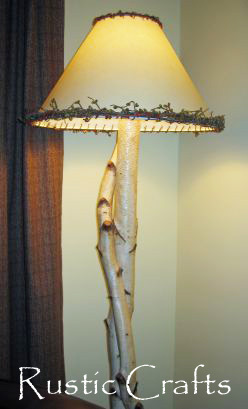 In fact, at any of the craft shows that we had visited, before selling, I don’t think that I ever saw a booth selling birch tree lamps! Are you wondering if they were a good seller? Well, the answer is that they were HOT! We could hardly make them fast enough, between shows, to keep up with the demand. We had a great little business going and probably would have kept up with it if it hadn’t been for a job change and relocation. 1. Quality: Make something that you are good at. Don’t try to force yourself into a niche that you are not comfortable or proficient at. Just because someone else has been super successful at selling jewelry crafts doesn’t mean that you will be if you don’t have the same passion or know how for that type of craft. Stick with something you enjoy and make it well. Chances are, if you enjoy your craft it will be reflected in how the end product turns out. 2. Uniqueness: Don’t try to be just like everyone else. Buyers will get tired of seeing the same thing booth after booth. Add some type of unique element to your design that makes it stand out from the rest. This will give you an edge over your competition, especially if you are creating a common craft. 3. Pricing: Compare what you are selling to what is out in the market and try to price your craft as low as you can with still making a nice profit. For example, no one was selling lamps like ours at craft shows however you could find manufactured lamps or artisan made, that were similar, in retail rustic stores. 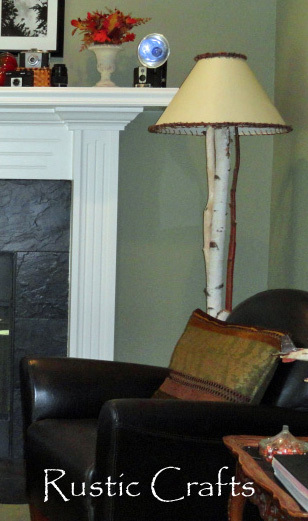 We found that many of the floor lamps were priced at above $300, and some much more. Since our costs into the lamps were quite low, we could price the floor lamps at $120-$150 and make a nice amount of profit. The key is to find ways to keep your material costs as low as possible. We found a wholesale lamp company that was willing to sell us lamp parts and shades at wholesale prices if we bought a certain amount per year. This helped us tremendously in keeping our costs down. 4. Style Trends: If you are making a craft that is to be used for home decor it is very important to stay on top of style trends. Some items are fairly classic and traditional but the more trendy items will not stay in style forever. I remember going to craft shows when I was first married and seeing nothing but Country crafts – shelves with the heart cutouts, wooden figures to set everywhere, cute little wooden signs. Today, Country is still in but the look has changed a bit. It is now more shabby chic with distressed signs and more use of vintage and old wood. Just little changes that could have a big impact on the way your craft appears. Keep up to date with decorating blogs and magazines for what is being seen in homes right now and be willing to update and change your craft decor as needed. I hope this helps you to narrow down your choices. Hey Debi, You are welcome for the tips! If you just got your website up and running, it does take a while to start bringing in traffic to your site. Be patient…if your signs were selling well at work they probably will on your website too. Just do everything you can to make your site search friendly and you will be found :). you can cross reference you web site address on face book. What about selling on Esty? Melissa brings up a good point. Check out all my posts under “Craft Business” where I cover where to sell and how to promote your site. Thank you, what a fun post! Yes we still see the country decor with hearts! You have given a lot of food for thought! Thanks Carol, I’m glad you liked it! More thanks for the tips. Thankfully, we’re doing ’em too and are tried and TRUE. If you ever do a post on Craft Show set-ups, let me know. My BF/partner does the most amazing set-ups. OH, and great job straightening up your comment section. I’ve been chattin’ at ya’ all night, lol. Ooops, had to come back to post to Debi. Neutrals/shabby chic is trending VERY hard right now. Check out the popular magazine covers, it’s all over them. Have you painted/distressed any of your signs with whites/grays/robin egg blue? Try a few, I think you’ll do well. What a creative idea! I can really see this working with the neutral colours that are so popular right now.